LANDOVER, Maryland, November 20, 2012 (ENS) – The Galapagos Islands have been famous for a century and a half, but even Charles Darwin did not suspect that the archipelago’s list of living wonders included coral reefs. 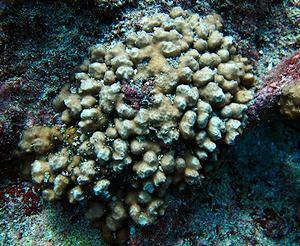 It took until the 1970s before scientists realized that the islands do, in fact, have coral. But in 1983, the year the first major report on Galapagos reef formation was published, they were almost obliterated by El Niño. This summer, a major coral survey found that some of the islands’ coral communities are showing promising signs of recovery. Their struggle to survive may tell us what is in store for the rest of the world, where almost three-quarters of corals are predicted to suffer long-term damage by 2030. 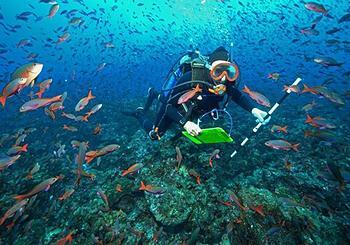 The Galapagos are a tough place for coral to grow. Directly on the equator in the eastern Pacific, the islands sit at the intersection of five major ocean currents, both warm surface currents and cool, deep currents. The result is a marine climate that changes rapidly from island to island and season to season – not an ideal situation for organisms that are especially sensitive to changes in water temperature. Yet, in the 1970s researchers discovered that numerous places in the 16-island archipelago did have coral, some of which had accumulated into reefs, especially in the warmer waters around the northernmost islands. Then, the unusually strong 1982-1983 El Niño climate event brought warmer waters that killed over 90 percent of corals in parts of the Galapagos. Warm waters cause corals to lose their crucial symbiotic algae, which causes bleaching and leaves them more prone to disease. Another strong El Niño in 1997-1998 threatened to seal their fate, but some corals managed to survive. In June, a team of researchers with the Khaled bin Sultan Living Oceans Foundation’s Global Reef Expedition, a six-year survey of coral reefs worldwide, spent 18 days aboard the Golden Shadow research vessel in the Galapagos, surveying the corals of eight islands. They wanted to see how the corals had recovered from the ravages of recent decades, and what were the most important factors that made them resilient to environmental disturbances. “The Galapagos offered a unique field laboratory to help us better understand how temperature extremes and increasing acidity will affect the survival and growth of reef building corals in the future,” says Andrew Bruckner, chief scientist for the expedition. Overall, the team found signs of coral recuperation at three northern islands: Marchena, Wolf and Darwin. Team member Derek Manzello of NOAA looked at how the relatively higher levels of carbon dioxide, CO2, in the waters around the Galapagos affected coral growth rates. The islands owe their wealth of marine life to the deep, cold currents that bathe them in nutrients brought up from the ocean depths. These same currents also bring high amounts of CO2, a byproduct of decomposition. This situation could make the islands a window into the future of reefs around the world, since about a quarter of the CO2 produced in the past century has ended up in the ocean, where it makes the waters more acidic. Acidic waters weaken reefs by interrupting the creation of calcium carbonate, the substance that provides their hard structure. Manzello found CO2 levels in the northern islands were about 40 percent higher than they were in preindustrial times, based on samples taken from ice cores, which is similar to levels researchers are finding throughout the tropics. In comparison, CO2 levels around the southern islands have roughly doubled since pre-industrial times, which could explain why corals there are not recovering as well as they are farther north. Another member of the expedition, Iliana Baums of Penn State University, examined how two similar species of reef-building coral reproduce, and how this depends on the reef community surrounding them. Porites lobata reproduces sexually, by releasing sperm and/or eggs into the water, which are carried off to found new coral. 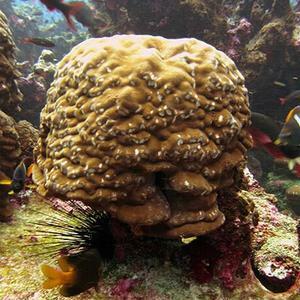 Its identical-looking relative Porites evermanni often reproduces asexually, which can happen when pieces break off – in its case, from certain species of triggerfish biting off pieces of coral in search of mussels that live inside – and form new corals nearby. Asexual fragmentation is limited to the immediate vicinity, while sexual reproduction can “reseed” new coral communities over much longer distances. In the Galapagos, the mussels are common but triggerfish of the right species are not. Baums found that fragmenting Porites evermanni does not grow there as often, possibly because they need the fish to reproduce. So climate change could affect the coral not only by raising the water temperature, but also by how it affects the mussels and fish. The Global Reef Expedition is a project of the Khaled bin Sultan Living Oceans Foundation in Landover, Maryland. The goal is to survey and map remote coral reefs, often in countries who are not able to do it themselves, to help identify high-priority sites for protection. Local scientists team up with researchers brought in by the foundation, which assumes all the costs. All data and maps are turned over to the host countries at the end of each mission. The Global Reef Expedition started its six-year mission last year in the Caribbean, surveying reefs in the Bahamas, St. Kitts & Nevis, Jamaica, Navassa, Colombia and the Galapagos. The Golden Shadow is currently in the South Pacific, and will work its way west around the globe until 2017.